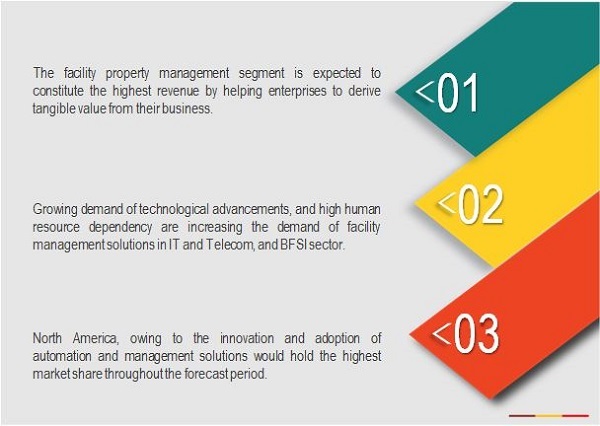 [197 Pages Report] The overall facility management market size is expected to grow from USD 32.21 billion in 2017 to USD 59.33 billion by 2023, at a Compound Annual Growth Rate (CAGR) of 11.4% during the forecast period. The facility management market is in its growing stage. This can be attributed to the fact that there has been an increasing adoption of disruptive technologies, such as cognitive computing, augmented reality, IoT and analytics, and robots and drones, in the facility management area . Facility management solutions have helped enterprises in different verticals improve their revenue margin by enhancing their overall operational efficiencies. Enterprises in the BFSI, and IT and telecom verticals are the early adopters of facility management solutions, as these enterprises have high human resources dependency. The base year considered for the study is 2017, and the forecast has been provided for the period between 2018 and 2023. Enterprises face economic pressure from regulatory authorities to optimize their business processes and make them environment-friendly. Moreover, high scrutiny and stringent regulations have forced the management teams to deploy technological solutions that can optimize their facility management process while mitigating the associated risks. Enterprises need to comply with major industry standards, such as Environmental Compliance Certificate (ECC), Occupational Safety and Health Administration (OSHA), and Food and Drug Administration (FDA). Therefore, it has become necessary for companies across all verticals to adhere to these government guidelines and stringent regulations for enhancing the safety of the environment and their employees. Additionally, facility managers face challenges in optimizing the energy consumption costs while ensuring minimum environmental impact from their existing industrial infrastructure. Regulatory compliances are encouraging companies to maintain the industry standards and mandates for all business processes. These benefits of facility management solutions have played a major role in attracting large numbers of customers from various verticals. 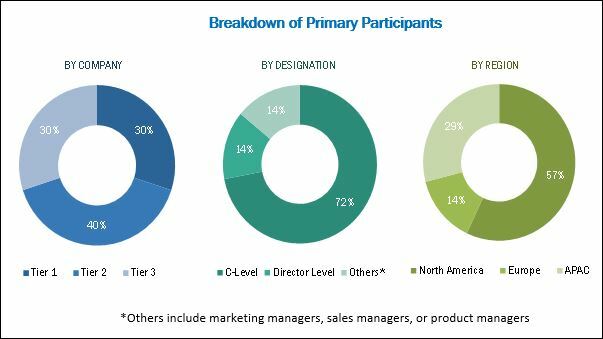 During this research study, major players operating in the facility management market in various regions have been identified, and their offerings, regional presence, and distribution channels have been analyzed through in-depth discussions. Top-down and bottom-up approaches have been used to determine the overall market size. Sizes of the other individual markets have been estimated using the percentage splits obtained through secondary sources such as Hoovers, Bloomberg BusinessWeek, and Factiva, along with primary respondents. The entire procedure includes the study of the annual and financial reports of the top market players and extensive interviews with industry experts such as CEOs, VPs, directors, and marketing executives for key insights (both qualitative and quantitative) pertaining to the market. The figure below shows the breakdown of the primaries on the basis of the company type, designation, and region considered during the research study. The facility management market includes various vendors providing facility management solutions and services to commercial clients across the globe. Companies such as IBM (US), Oracle (US), SAP (Germany), MCS Solutions (Belgium), ARCHIBUS (US), Trimble (US), CA Technologies (US), Accruent (US), Planon (Netherlands), FM:Systems (US), iOFFICE (US), Maintenance Connection (US), JadeTrack (US), MetricStream (US), Facility Management eXpress (US), eMaint (US), Hippo CMMS (Canada), FSI (England), Indus Systems (US), Autodesk (US), Nemetschek (Germany), Archidata (Canada), OfficeSpace (US), FacilityONE Technologies (US) and Apleona (Germany) have adopted partnerships, agreements, and collaborations as the key strategies to enhance their market reach. In February 2018, SAP launched SAP Asset Strategy and Performance Management solution to enhance asset intelligence across the digital supply chain. This new solution is expected to help SAP clients define, plan, and monitor performance data across a network of connected assets in real time. In January 2018, Accruent acquired Kykloud, a UK-based provider of facility and asset surveying and management software. This acquisition is expected to enhance the Accruent’s existing strength in capital planning and asset management. In May 2017, Trimble completed the acquisition of Network Mapping Group Limited (NM Group). This acquisition is expected to expand the Trimble solution portfolio to provide high-value data modeling and 3D visualization of assets for the utilities industry. What are new application areas which the facility management companies are exploring? Further breakdown of the US and Canada market into solutions, services, organization size, deployment type, and vertical. The overall facility management market is expected to grow from USD 34.65 billion in 2018 to USD 59.33 billion by 2023, at a CAGR of 11.4% during the forecast period. 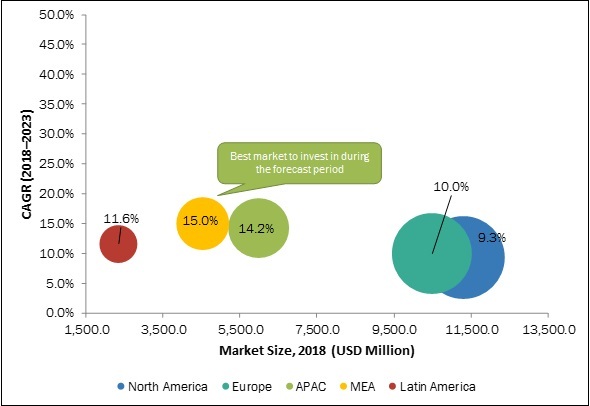 The Increasing demand for integrated facility management to achieve economies of scale, changing focus to virtual workplace and mobility, increasing development of the sustainable infrastructure, emergence of the SaaS deployment model, growing adoption of IoT and smart connected devices for building automation are the key factors driving the growth of this market. Facility management functions have evolved into a major, thriving business sector that continues to grow across verticals. Enterprises have started to shift away from the notion of facilities being a set of back-office activities and are starting to realize the importance of facility management as a set of functions that can enhance the value of specific organizational processes. Enterprises can only achieve success and growth through the efficient and effective management of complex operational business processes in their facilities. The global facility market has been segmented by solution, service, organization size, deployment type, vertical, and region. The facility operations and security management segment is expected to register the highest CAGR between 2018 and 2023. To manage operations areas, such as facility lighting, HVAC, video surveillance, access control, and emergency and response, across organizations, facility managers need effective facility operations and security management solutions. The facility management market in MEA is expected to grow at the highest CAGR during the forecast period. In recent years, the MEA region has witnessed high adoption of tech-savvy solutions across various verticals. Increasing construction activities, and government plans for improving education systems and healthcare facilities are the major factors expected to drive the facility management market growth in this region. Moreover, the growing private sector, investments in the transportation and logistics vertical, and the need to enhance the asset life cycle are expected to further drive the demand for effective facility management and automation solutions. With growing receptivity to technological advancements, there has been a continuous demand in IT and telecom enterprises for facility management solutions to complete their critical projects. Facility management solutions help companies in the IT and telecom vertical with network upgrades, project management, and site and asset management. These solutions play a key role in the management, operations, and maintenance of IT and telecom assets through the effective use of data and IoT. Enterprises in the banking vertical have to manage multisite facilities and face various challenges in managing the operations processes of their facilities. Due to the distributed portfolio of locations, facility managers face challenges in managing the facilities at small, rarely visited remote sites, outside the major city hubs. Enterprises in the BFSI vertical have to deal with the maintenance and management of various real estate investments. Facility management solutions, such as IWMS and CMMS, strategically help facility management teams manage various operations processes, such as asset management, maintenance management, space management, and work order tracking. Facility management has become one of the most important tasks for enterprises in the government and public administration vertical. Facility managers in government and public administration organizations have to deal with a variety of infrastructure and other related properties. Enterprises in this vertical are accountable to the public. Shrinking budgets and increasing customer demands are the biggest challenges in daily and long-term operations, which makes it critically important for this vertical to utilize facility management solutions for improving the efficiency and decreasing costs. The use of different solutions, such as CAFM, IWMS, commercial property management software, and real estate asset management systems, in the real estate sector has enabled enterprises to generate significant revenues. These solutions help enterprises in the real estate and property sectors manage infrastructure changes, ensure efficient space usage, increase profitability, and reduce expenditure, among others. What are the upcoming industry applications for facility management market? Lack of managerial awareness and dependency on the in-house facility management issues is restraining the growth of facility management market. To reduce operations costs, facility managers are trying to perform all workplace management tasks in-house. However, some facility managers are gradually deploying facility management solutions, but there is still a considerable lack of awareness related to these solutions. Despite facility management being an important part of operations, enterprises are unaware of the evolving solutions. This has made it a complex task for organizations to give equal importance to their facility management department. Key players in the market include IBM (US), Oracle (US), SAP (Germany), MCS Solutions (Belgium), ARCHIBUS (US), Trimble (US), CA Technologies (US), Accruent (US), Planon (Netherlands), FM:Systems (US), iOFFICE (US), Maintenance Connection (US), JadeTrack (US), MetricStream (US), Facility Management eXpress (US), eMaint (US), Hippo CMMS (Canada), FSI (England), Indus Systems (US), Autodesk (US), Nemetschek (Germany), Archidata (Canada), OfficeSpace (US), FacilityONE Technologies (US), and Apleona (Germany). These companies have been at the forefront in offering reliable facility management solutions and services to commercial clients across diverse locations.